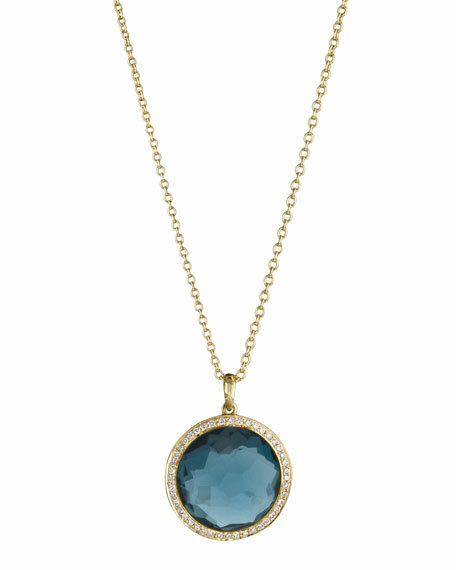 Pair this diamond-trimmed topaz Ippolita pendant necklace with a scoop neckline that creates a clear backdrop. From the 18k Gold Rock Candy® Collection. Round London blue topaz pendant trimmed in pave diamonds. With every purchase Akola reinvests 100% of profits to empower women and families in poverty. Akola long multi-bead necklace. 18-karat gold plating over brass. Amazonite, bone and glass beads. Raffia-wrapped accent bead. Slipover style. Approx. 36"L. Made in USA.